The NASA satellite, Swift, has now detected its 1000th gamma-ray burst. Since the launch of the satellite in 2004, it has revolutionised research into gamma-ray bursts. 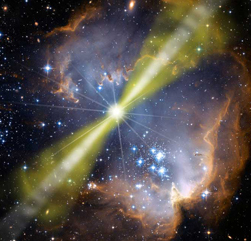 Gamma-ray bursts are one of nature’s most spectacular phenomena. Gamma-ray bursts are very high-energy flashes of gamma radiation, which arrive from space about once a day. They were discovered by chance during the Cold War in the late 1960s, but their origin was a mystery until 1997, when scientists finally found the answer. Gamma-ray bursts mark the final stage in the life of very massive stars, during which it is believed that a fast-rotating black hole is created. Swift gamma-ray burst number 1000 was detected Tuesday, 27 October at 23:40:40 Danish time. It has received the not very poetic name GRB151027B after Gamma Ray Burst (GRB), and B because it was the second gamma-ray bust observed that day. Swift detected the burst in γ-radiation and could then use its X-ray camera to more precisely pinpoint the burst in an area in the constellation Eridanus (The River). The optical afterglow was discovered by the Danish gamma-ray burst research team at the Niels Bohr Institute using the Nordic Optical Telescope. “The optical afterglow was detected 1.04 hours after the gamma-ray burst, as soon as the sun had set on La Palma, where the Nordic Optical Telescope is located. We then secured a spectrum of the optical afterglow using ESO’s Very Large Telescope and the X-shooter spectrograph approximately 5 hours after the burst, when night fell in the Atacama Desert in Chile, where the VLT is located. This is a good example of how several observatories work together and support each other,” explains Johan Fynbo, professor at the Dark Cosmology Centre at the Niels Bohr Institute, University of Copenhagen. From the X-shooter spectrum, the researchers can measure the so-called redshift, which is a measure of how great a distance the gamma-ray burst is coming from. 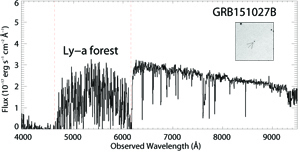 The gamma-ray burst GRB151027B had a redshift of 4.063, which means the light has been underway for approximately 90 percent of the time since the Big Bang, or about 12.3 billion years. “The burst tells us about a very different and younger universe than what we see around us. The light contains important, very detailed information about the conditions in the galaxy where the star that made the gamma-ray burst came from. In particular, we can measure the exact abundances of elements like hydrogen, sulphur, iron and silicon. The preliminary analyses show that the galaxy has a surprisingly high content of heavier elements relative to hydrogen – at least as much as the Sun, which was formed much later – about 4.5 billion years ago,” says Johan Fynbo. In this way – one gamma-ray burst at a time, researchers are mapping out how the formation of the elements occurred over time in the history of the universe.